Spent the afternoon designing the rosette with Hans. 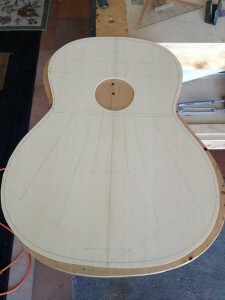 Originally, I purchased a pre-made rosette from Luthier Mercantile. We both thought that by using a pre-made rosette on my first build it would be an easier way of getting to the finish line quicker, experiencing the build process, and having a nice look. However, upon arrival of the new rosette, we discovered that the rosette was not perfectly round. Because you have to rout a channel, aperfect circle, this rosette would not work. As with life, things fall into place and I ended up getting what I originally wanted. I love the look of a striped rosette, and the rosettes of Torres and early Ramirez guitars. Usually basic black stripes, but super clean and unique. 1. 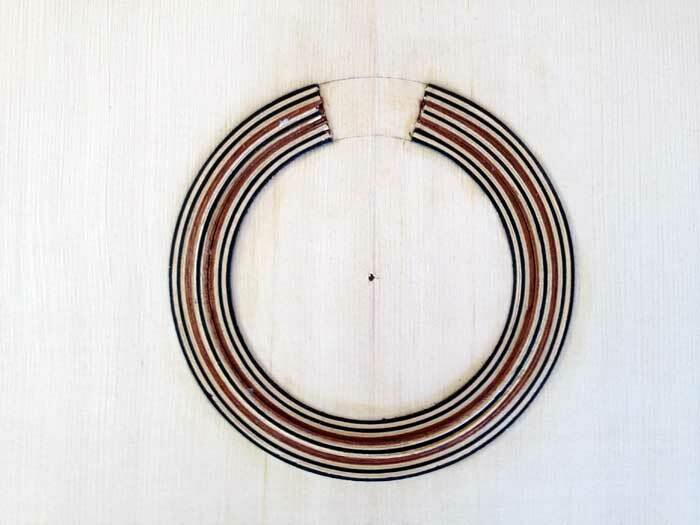 Cut 16″ lengths of 3mm wide strips from Ebony, Maple & Mahogany veneer. 2. Find the center of the sound-hole, and scribe a perfect circle – Hans did this as I would definitely ruin the soundboard. 3. Rout a 19mm channel along the scribed lines. Again, work for the master, not the student. 5. Using super glue and straight pins, inlay each strip around the channel until channel is filled with a rosette ( see above image). 6. Plane inlaid strips to desired thickness of soundboard and stare at it for long periods of time. Repeat step 6 over and over until you find tiny flaws.